The calendar says that in the Northern Hemisphere, in the United States, we are now in the season of Fall. The fall equinox was 9/21-22. In the U.S., we have all grown up going to school in the fall. It is the beginning of the new year, the new grade. Summer is over, and we move to the next level or stage of life. I have always felt that 12 –16+ years of this conditioning has made many of us think of fall as the new year. It is full of excitement and expectation. A new class year. New friends and challenges. A new television “season” – now a legacy concept. Newness and kinetic and optimistic energy in the air. Some of us measure years and accomplishments from birthday to birthday in addition to Fall to Fall. Both of these are human, personal and we are conditioned to them. The calendar – and commerce- make us think that the new year starts on January 1. Yet to me that has always felt the most contrived of the three as it is not personal. What does a ball dropping have to do with my life? Which is why I usually stay home with the one(s) I love and be close with them. Why write about fall? Well, it goes without saying that I will be called upon to write columns around New Year about what might occur in 2019. I have already been contracted to do so. So, I will be doing that again, in this space, as well, as it is expected. I want to break that ritual a bit. In December and January every single media entity will be serving up 2019 forecasts, predictions and suggestions about what might be the next big thing or product of the year. I don’t like to be part of the herd. Never have. So, for those of you for whom fall means newness and a new start, what follows are some thoughts on what might occur between now and summer. A big one. In many ways this mid-term election is being called the most important one in a life-time. I agree. I think there will be a “blue wave” the only question being the size. It will be dominated by women; it already has been. It could be strongly influenced by the 18-24 vote. In 2014 the total turnout was 42% of voters with the 18-24 group at 27%. As the 2000, 2004 and 2016 elections pointed out, EVERY vote makes a difference. All of those were decided by one vote per precinct nationally. I remember speaking with some young women at Ringling College right after the Trump inauguration and the Women’s march and they were all amped up by the march. I asked them if they voted. They bowed their heads and said they hadn’t. We live in the greatest living example of Democracy in history and if you don’t show up and vote- BE QUIET! Between now and a year from now, there will be a significant economic disruption, most likely triggered by debt defaults and geopolitics. The bull market will end. I am not a market timer in the least, but I do think that if you are an active investor, be very careful as we move into the 1st quarter of 2019. Cryptocurrencies will continue to be all over the place. It will interesting to see what happens to them when the equity markets go into major correction, something that hasn’t happened yet. Autonomous vehicles are now being sold to the public, cities and governments. Expect to see one on the road in the next year. Expect to see ever more electric bikes and scooters for temporary use. These new forms of personal transportation are well-suited for neighborhoods, congested cities, large university and corporate campuses and smaller communities. The great science fiction writer William Gibson famously said: “The future is here, it just not evenly distributed”. This can be translated into: if climate change has not yet adversely affected where you live, it will. The warming oceans means that more hurricanes will be hitting the lower and middle Atlantic states. Look at North Carolina, which has allowed rampant development with no consideration of this new reality. Does one rebuild when “once every 500 years” storms happen every few years? I live in Sarasota FL. It is a community of beaches on barrier islands. The most expensive real estate is beach front. One of the major beaches is Lido Beach. It is now basically 75% gone, due to two sub-tropical depressions – not even hurricanes- in the last year, one more than 100 miles off the coast. 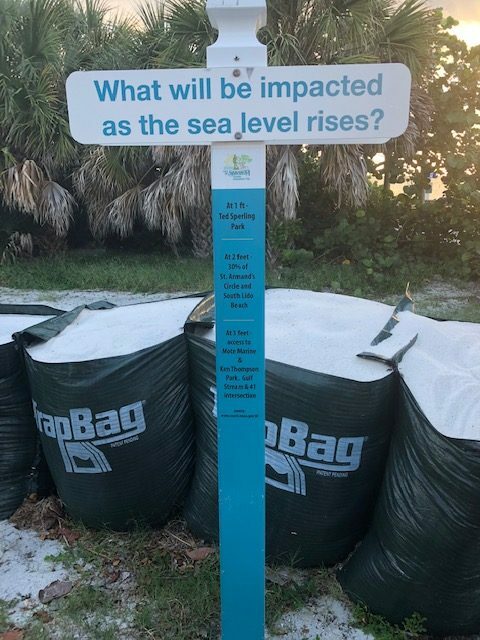 Due to rising sea levels, beach replenishment is an expensive short-term non-solution. There will be escalating discussions, particularly for those on Sarasota’s barrier islands, as to when might be the best time to sell in the years ahead to get ahead of the inevitable rush to sell once it is clear that real estate values on these islands will begin to decrease in value. It is the question I am most often asked by residents. 2018 is the year when climate change became real. It is clear that some planetary tipping point has been crossed. Forest fires north of the Arctic Circle, fires in Greece, the largest forest fire in the history of California, massive flooding in the Carolinas, record breaking temperatures all around the world. Monsoons, typhoons and hurricanes more powerful than usual. This means that, on a large-scale basis for the first time, people will now start to think about real estate through the lens of climate change. This is due, in part, to the fact that insurance companies and re-insurance companies are shouting that climate change is “the mother of all risks”. That translates into either not insuring at risk areas or charging vastly higher premiums and higher deductibles. That is the reality many in North Carolina face and Houston continues to face. In the next year, residential real estate in general will flat line. Prices and mortgage rates have gone up, yet incomes have not. There is already declines in real estate values in such overpriced markets as NYC, SF and Seattle. Remember, my only real responsibility as a futurist is to be right about the future. I have no position other than that. So. go out and enjoy a wonderful fall and prepare for a economically disruptive winter, spring and summer. Prev: What Will Trigger the 2019 Economic Disruption?